Goodwood: The House of Rolls-Royce has announced its Spring/Summer 2017 Couture collection. Signature detailing in vibrant colour will complement pallettes of classic white as Dawn is Inspired by Fashion. Under the stewardship of Design Director Giles Taylor, a team of talented designers were hand-picked from the worlds of fashion, fine textiles and luxury accessories including textile specialist Cherica Haye from the Royal College of Art and leather technologist Michelle Lusby who previously worked at Mulberry. Their work has seen the incorporation of fine silks and unexpected textures into the interior environment of truly bold and distinctive Bespoke commissions. They have conceived and executed Bespoke commissions with a depth of inspiration far beyond the traditional automotive palette. In creating Dawn Inspired by Fashion, these designers selected the neutral canvas of white upon which to base three vibrant colours that will set the tone for 2017’s Spring/Summer collection; Mugello Red, Cobalto Blue or Mandarin. Subtle accents of these colours adorn interior aspects of each Dawn, whilst the ‘Silent Ballet’ of the roof as it rises to provide shelter from the paparazzo’s lens unleashes a brushstroke of colour to catch the style-spotters eye. Like the finest Bespoke garments, individuality is forged in the subtlest details. On opening Dawn’s coach-doors a contemporary Arctic White and Black interior colour scheme is accented by one of the three vivid colours: Mugello Red, Cobalto Blue or Mandarin. 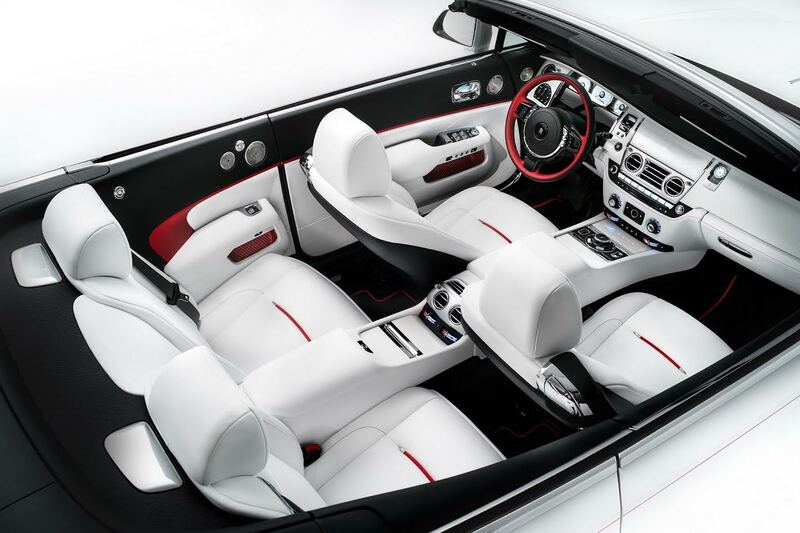 The Arctic White leather of the seats is accented through the embroidery of the headrests, as well as the stitching and piping of the seats. Seamless stitching, a highly complex craft technique from the world of fine tailoring, is applied to the steering wheel to ensure the perfect line joins the two colours of leather around the rim. Tactility, comfort and quality are an important attribute of the piece itself. Rolls-Royce’s designers took inspiration from this approach in appointing the car’s front and rear door pockets with fine silks, adorned with an abstract representation of the Spirit of Ecstasy with each emblem set precisely at fifty-five degrees to complement the lines of the door. The remarkable craftsmanship and attention-to-detail employed in the creation of any Rolls-Royce is evident in the exquisite application of wood to the dashboard, with the lacquering process for Dawn Inspired by Fashion alone taking nine days of painstaking work. This is completed elegantly with the integration of a Bespoke Clock, set as a piece of jewellery, styled exclusively to emit a silver on silver effect, evoking the metallic fabrics seen on this year’s catwalks in preparation for next year’s season.